Download "User's Guide. 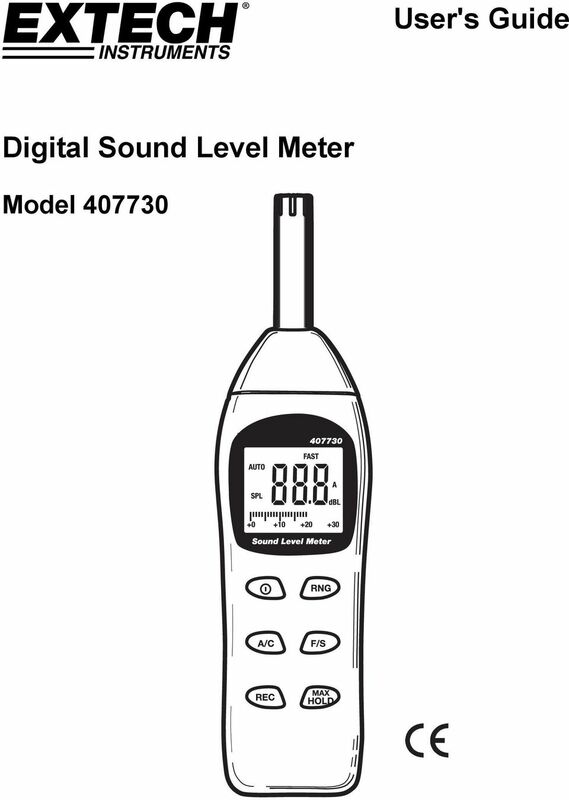 Digital Sound Level Meter. Model 407730"
3 Operation 1. Power the meter by pressing the power button. 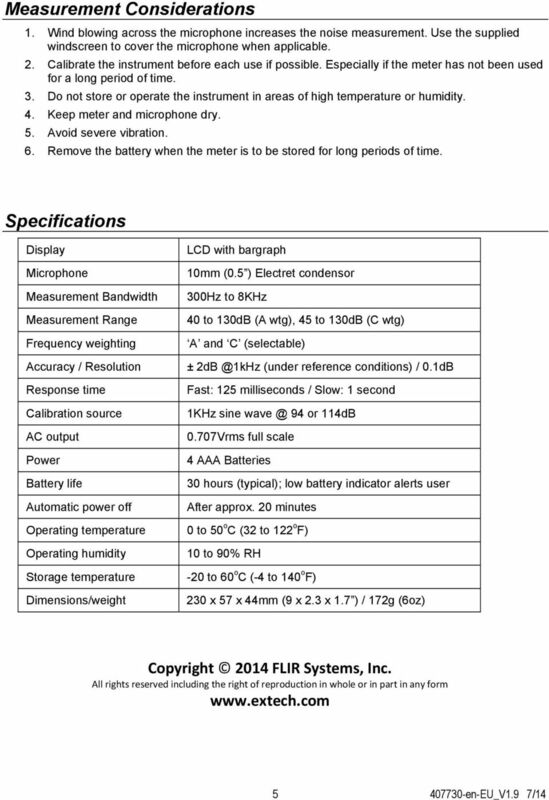 The meter will begin displaying sound level readings. If the LCD does not switch on, check the 9V battery located in the rear battery compartment.. Hold the meter away from the body.. View the measurement on the meter s display. If the meter is in the autoranging mode, the display may briefly indicate HI or LO if the noise level is above or below the currently selected range. The meter will change the range as needed to display the db level. A and C Frequency Weighting Use the A/C button to select A or C frequency weighting. With A weighting selected, the frequency response of the meter is similar to the response of the human ear. A weighting is commonly used for environmental or hearing conservation programs. C weighting is a much flatter response and is suitable for the sound level analysis of machines, engines, etc. A or C icons will appear in the display. Most noise measurements are performed using 'A' Weighting and SLOW Response. FAST and SLOW Response Time Use the F/S button to select FAST (1 ms) or SLOW (1 second) response time. Select FAST to capture noise peaks and noises that occur very quickly. Select the SLOW response to monitor a sound source that has a consistent noise level or to average quickly changing levels. FAST or SLOW icons will appear in the display. Select Slow response for most applications. 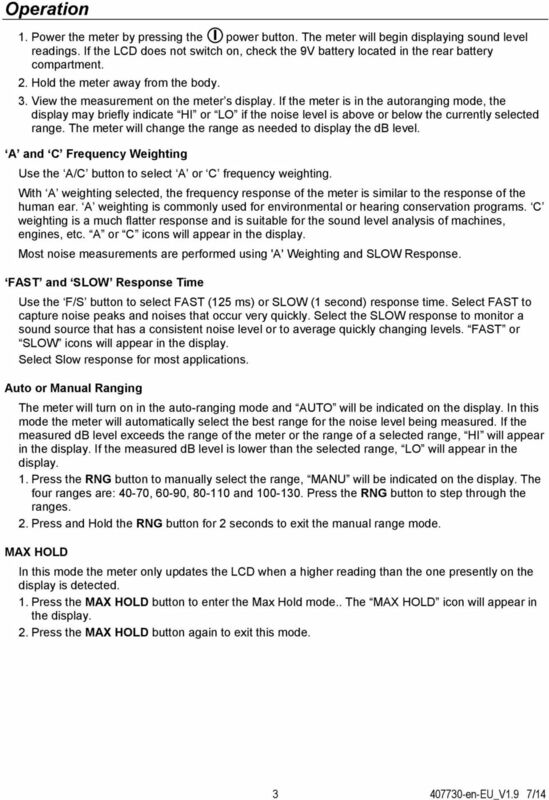 Auto or Manual Ranging The meter will turn on in the auto-ranging mode and AUTO will be indicated on the display. In this mode the meter will automatically select the best range for the noise level being measured. If the measured db level exceeds the range of the meter or the range of a selected range, HI will appear in the display. If the measured db level is lower than the selected range, LO will appear in the display. 1. Press the RNG button to manually select the range, MANU will be indicated on the display. The four ranges are: 0-70, 60-90, and Press the RNG button to step through the ranges.. Press and Hold the RNG button for seconds to exit the manual range mode. MAX HOLD In this mode the meter only updates the LCD when a higher reading than the one presently on the display is detected. 1. Press the MAX HOLD button to enter the Max Hold mode.. The MAX HOLD icon will appear in the display.. Press the MAX HOLD button again to exit this mode. 4 MAX/MIN Recording In this mode the meter records the Maximum and Minimum readings and stores them into memory. 1. Press the REC button to enter the RECORD mode. The REC icon will appear in the display.. Press the REC button again to display the minimum value recorded since the mode was entered. The MIN icon will appear in the display. The meter is not recording during this time.. Press the REC button again to display the maximum value recorded since the mode was entered. The MAX icon will appear in the display. The meter is not recording during this time.. Press the REC button again to display the present db level and continue recording.. Press and hold the REC button until the REC icon clears to exit the mode. Auto-Power Off The meter will automatically shut off after 0 minutes of operation. To disable this feature: 1. With the meter OFF, Press the and MAX HOLD buttons simultaneously.. will appear in the display. Release the button and then release the MAX HOLD button.. The meter will remain on until the power button is pressed. 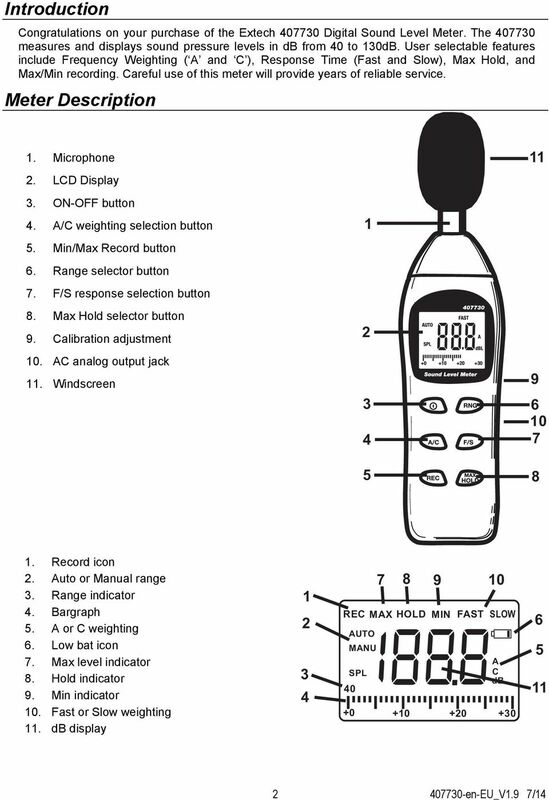 Calibration To calibrate the meter, an external calibrator such as the Extech 077 or the Extech is required in addition to a small screw-driver. 1. Turn the meter ON. Select the 80 to 110dB range. Select A weighting and SLOW response. Place the microphone into the calibrator. Set the calibrator to output a 1kHz sine 9dB. Adjust the calibration potentiometer for a display as close as possible to the calibrator s output Battery Replacement When the low battery icon appear replace the battery by removing the screw securing the rear battery compartment and replacing the AAA batteries. You, as the end user, are legally bound (Battery ordinance) to return all used batteries and accumulators; disposal in the household garbage is prohibited! You can hand over your used batteries / accumulators at collection points in your community or wherever batteries / accumulators are sold! 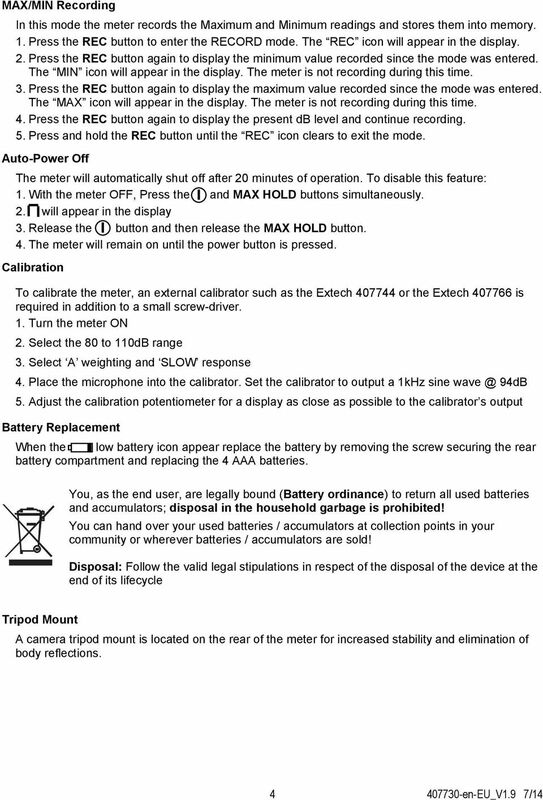 Disposal: Follow the valid legal stipulations in respect of the disposal of the device at the end of its lifecycle Tripod Mount A camera tripod mount is located on the rear of the meter for increased stability and elimination of body reflections.